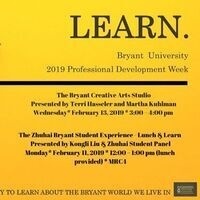 During this fun and informative lunch and learn session, Bryant Zhuhai students will share stories about their experiences as international students at our Bryant Smithfield campus. Students will share photos, memories, and what they've most enjoyed about their time in the United States. It is good to see that the transfer students have not only developed fluent language skills, but also cultivated a sense of confidence as compared to most Chinese students I see.